When you setup integration with a 3rd party vendor, MyEDiary provides you with the ability to control which data is managed by that integration. This is done by setting the Data Source for the different 'sync-able' data to be either a particular integration or to be managed internally. WARNING! Setting an Integration as a Data Source will cause all existing data for that resource to be replaced by the data held within the integrated system as soon as the integrated system next syncs. 1. Depending on how the 3rd party vendor is configured, the next time it syncs to MyEDiary all data previously held by that resource will be replaced with the contents of the same resource in the 3rd party vendor. 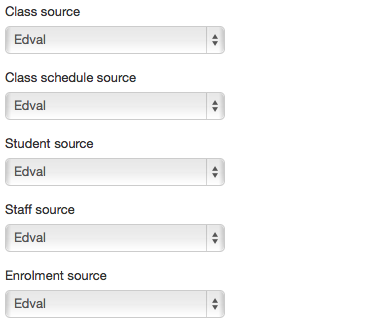 For example, if you choose to set the Data Source for Classes to your Edval integration, all of your existing class lists will be replaced with the class lists held within Edval. 2. With a Data Source set to an integration, the MyEDiary user interface for that particular resource will be disabled. For example, if you choose to set the Data Source for Staff to your Edval integration, you will no longer be able to manually add, edit or delete staff via the MyEDiary user interface. This includes loosing the ability to import staff via CSV import. The reason for this is down to the nature of the integration. Every sync completely replaces the data currently held within MyEDiary. Therefore, anything you were able to add manually or via CSV import would be overwritten with the next sync. Therefore, we disable the ability to manually add that data. Selecting 'Built-in' means that you control the data using MyEDiary's built-in tools. This means manually adding data through the various user interfaces or bulk-importing data via CSV Import. Note: Selecting 'Built-in' as a Data Source does not affect your existing data. If you have previously used an Integration as a Data Source but now what to manage that data internally, switching to 'Built-in' will retain the data previously obtained through the integration and will allow you to manage it manually. However, switching back to an integration will cause the data to be completely replaced, including any changes you may have made whilst the data source was set to 'Built-in'.